By now, if you haven't heard of Gritty, you probably haven't watched a sports channel or, more likely, logged onto the World Wide Web in a while. 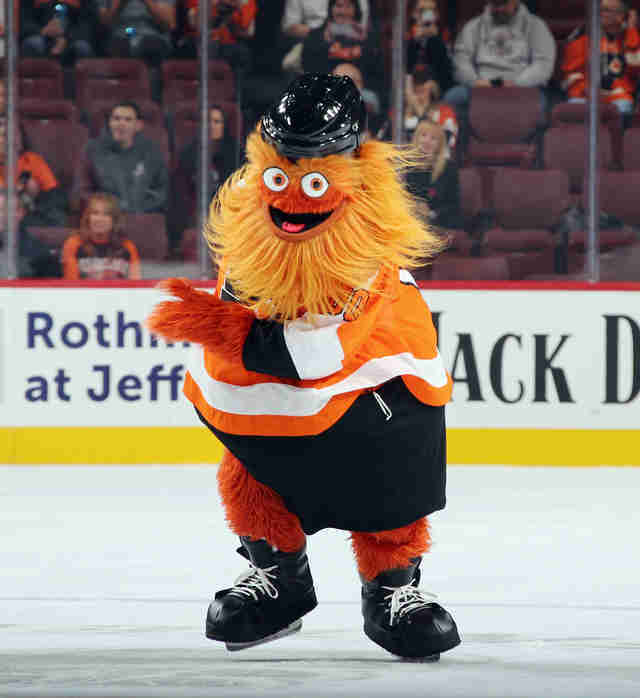 The Philadelphia Flyers' googly-eyed new mascot took the internet by storm merely two weeks ago, inspiring an immediate flood of memes about his extremely orange appearance and aggressive, yet playful, demeanor. He's a lover and a fighter. He'll play off a slip on the ice with a self-deprecating tweet. He loves to dance. Many have likened Gritty's appearance to the similarly nonsensical Philadelphian baseball mascot, the Phillie Phanatic: a green monstrosity with a bullhorn snout that might be a bird or might be a rejected Dr. Seuss creation, who has become a beloved addition to his team despite the fact that no one quite knows what to make of him still. 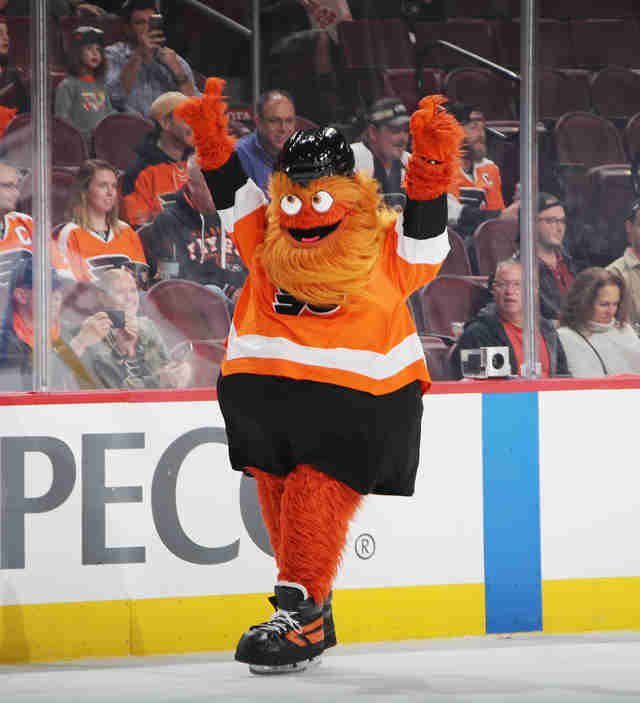 Gritty and the Phanatic have instant chemistry, doing things like comparing oversized bellies during a #BreakTheInternet moment last weekend when the orange fluffball surprised and delighted fans at a Phillies game. But Gritty and his green father share an even deeper connection: The original man in the Phanatic suit came up with Gritty's design. Newark, New Jersey, native David Raymond, who embodied the Phanatic for 16 years, revealed all to Delaware Online, including the fact that he'd been very candid with the team about the strong possibility of negative feedback to Gritty's debut. And, yes, most people were pretty horrified -- hell, even those of us who have come around to loving him are still a little bit horrified -- but even the negativity was tinged with a baffled air of protectiveness. "He's ugly, but he's our ugly," Raymond said. Honestly, the perfect response from a city that prides itself on being liked by no one. According to Gritty's official bio, the slack-jawed, muppet-mouthed creature was a reclusive subterranean being before construction disturbed his secret dwelling underneath the Wells Fargo Center and forced him to the surface. 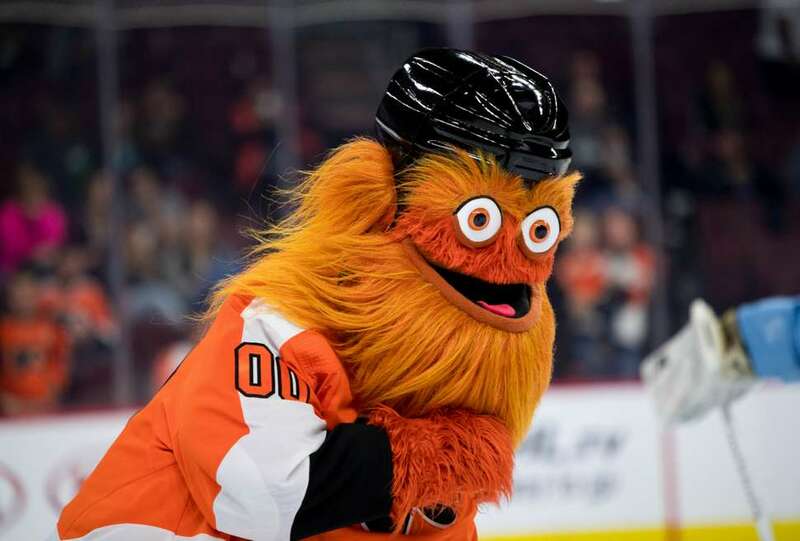 Fathered by a "bully," Gritty inherited some aggressive tendencies and a general bumptious demeanor but is fiercely loyal to his team and their fans, who swiftly grew to love their big nightmare boy. And those hideous, amazing googly eyes? Not in the original design, but when Character Translations, the company that built the Gritty costume in just two months, offered the detail (along with the ability to blow smoke out of his ears), the team could hardly say no. After two weeks of psychological torment through GIFs and memes, we can't imagine Gritty without them any more than we can imagine a world without Gritty. Emma Stefansky is an entertainment writer at Thrillist. Follow her on Twitter @stefabsky.